Pay attention to what I am telling you. 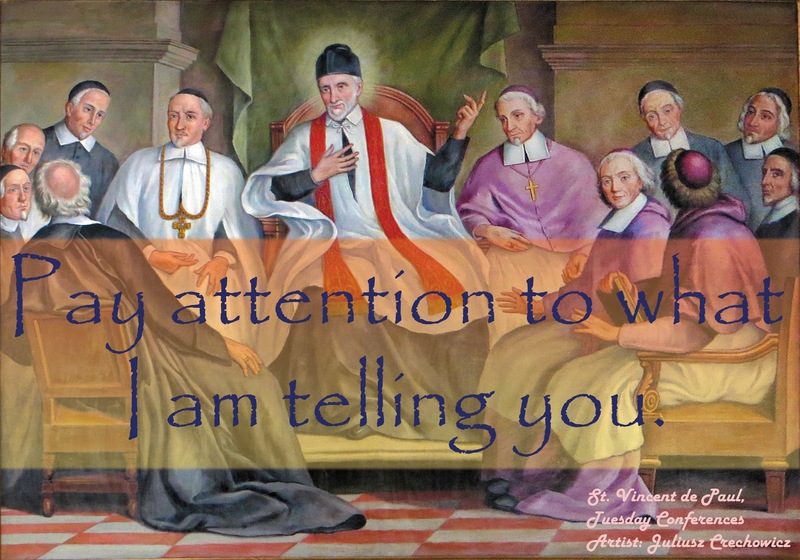 It is the feast day of St. Vincent de Paul! St. Vincent de Paul was one of our class' section back in high school. I went to a friar-run Catholic school and the sections during my time were the name of the saints. I cannot remember much about St. Vincent de Paul. However, all I know is that he is very generous especially to the poor. Being generous is not exclusively about giving material things to others. It can also be our time, our love, our selves, or anything that we have that we can share. One thing I can share is my listening skills. I must listen genuinely (very challenging) when others seek for someone to talk to. Honestly, I admit, sometimes I may look like I am listening attentively. But in reality, my mind has been already wandering off somewhere. I have this limit that I can only listen to a certain span of time. And after that, I get tired. That is why I need to pray before and after talking to a person or people because my energy get easily drained. Giving great attention is not only a skill but also a grace from God. If God does not want us to comprehend everything that we heard, then we will not understand any of it. It is through prayer that enable us to hear what God is really telling us.